Calcareous algae of order Bryopsidales, family Halimedaceae abound in shallow marine ramp facies of the Jbel Guersif Formation (late Thanetian), Ait Ouarhitane Formation (middle - late Ypresian) and Jbel Tagount Formation (latest Ypresian to late Lutetian or latest Bartonian), southern rim of central High Atlas, Morocco. The genus Halimeda includes nine new species, Halimeda erikfluegeli, H. lacunosa, H. barbata, H. marcconradi, H. praetaenicola, H. unica, H. praemacroloba, H. praegoreaui, H. praecuneata. Additionally, 14 modern and fossil taxa occur: H. cylindracea, H. incrassata, H. monile, H. opuntia, H. opuntia f. triloba, H. simulans, H. tuna, H. tuna f. platydisca, H. gracilis, H. copiosa, H. scabra, H. fragilis, H. nana, H. praeopuntia. For the first time, gametangia were observed in fossil species. All new species were of short range. Most appeared during adaptive radiation in the late Thanetian, associated with some already known fossil species and an ancient stock of modern Halimeda taxa (H. cylindracea,H. incrassata, H. monile, H. opuntia). 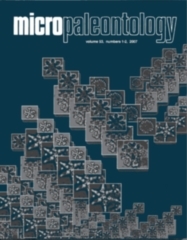 The adaptive radiation was connected with the marine transgression at the southern rim of the central High Atlas and is interpreted as part of the recovery phase after the end-Cretaceous decline of green algal diversity. Mid Ypresian to late Lutetian or latest Bartonian assemblages show minor origination rates but the onset of long-ranging extant species. These assemblages are interpreted to represent the stabilization phase of Paleogene green algal evolution, dominated by well-adapted species. At the beginning of the Lutetian, already twelve modern taxa of Halimedawere present. This proves geological longevity extending over more than 50 million years and characterizes the corresponding species, respectively the genus Halimeda, as living fossils. The results also prove the early origin of the basal clades of the genus Halimeda, defined from morphological and molecular data of extant species. Origin of the extant Sections Rhipsalis, Micronesicae, Halimeda and of an opuntoid basal clade is assumed to be prior to the Late Thanetian, either in the late Cretaceous or in the earliest Paleocene, following the end-Cretaceous extinctions. Separation of the opuntoid basal clade into the lineages of the present- day sections Pseudoopuntia and Opuntia was achieved before Mid Ypresian and further differentiation of the clades during the Ypresian and Lutetian, much earlier than hitherto postulated. Presumed timing of the origin of the basal clades of Halimeda and delayed first occurrences in southernMorocco invoke speciations of the recognized extant taxa outside of the peculiar Atlantic-bound Moroccan epeiric sea somewhere on the wide shelfs of the southern Tethys. Neogene vicariance events influencing the evolution of Halimeda are shortly discussed. Concerning the fossil record, they seem to be of minor importance except for the Holocene outburst of Recent taxa, which might be a sampling or preservational artifact. Halimeda-rich facies at the southern rim of the central High Atlas is comparable to modern Halimeda meadows and banks of the Great Barrier Reef. This concerns the almost total absence of other algae, minor lateral changes in the composition of the Halimeda flora, high diversity with analogous percentage of composition patterns, which show few dominant and common taxa, and quite a lot rare to very rare taxa. In both cases, psammophytic and lithophytic species co-occur, demonstrating sufficiently coarse-grained, immobile substrates. Both Halimeda floras flourish due to upwelling of cold, nutrient-rich waters.